Then we can say goodbye to February and hello March. Ahhh... what a wonderful month. St. Patrick's Day, the promise of spring around the corner, day light saving time, everything screams GREEN. Which happens to be my favorite color. Thing about it, Money is green, Golf courses are green, green peace, green eggs and ham-sam I am. We are still working at the club to get things ready for all of you. Even though it seems so far away, soon the sound of club heads striking the golf ball will ring through Richfield. Nothing quite like that sound. Kind of like the sound of a grandfather clock chiming on the hour. (or in Mr. Zupanc case, the sound of a tin can hitting the ball) It's that type of driver of his. What ever it is, it works for him. Keep up the good work John! Jeff and Josh have been out on the course in between the snow storms picking up sticks and debris, and observing what needs to been done to open the season. Lot's to do, but they are all fired up, and ready to rock!! Josh even played 36 holes Monday, dodging snow, and playing through the snow. You rock Josh!! (or your off your rocker) Ha! Just kidding buddy. A few friends have popped in to say hello and check in. Everyone is optimistic about the up coming season. Even with the tough economic times, I still believe that St. Bernard G.C., and golf in general, is still one of the best recreational investments you can make. Hope you agree. We look forward too seeing all of your smiling faces soon. Plenty of Par's and Birdies out there just waiting for you!! See you soon!! Hugs and Kisses Lucy, we love you!! 34 DAYS TO THE CHILLI OPEN!! March may come in like a lion but lets hope it takes all this cold snowy weather when it leaves like a lamb. The Tribe is tuning up in Arizona for their road opener on 4-5-09 against the Rangers, and the Browns are trading players, laying off employees and who knows what else is in store for them. Time to get the course ready for all the members who have had their clubs in cold storage all winter. There is a light at the end of this tunnel. GOLFMAMA, have you been slackin' off on the blog? How is everything on the course? Wet? Green? At least there's no snow...yet. 25 days to Chilli Open! Yes, slakin' off!! Sorry, been busy with other stuff. Sorry, you do not want to know!! 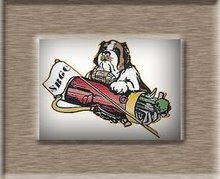 Too sum it up, It's no longer St. Bernard GOLF CLUB, It's now St. Bernard YACHT CLUB.....OY.... But soon we will be swinging the golf club and having fun at the 19th hole. Don't answer that.... Ok, go ahead..... See you soon I hope! Like tomorrow, Golfmama needs a Michelob!!! !